New Castle residents suffering from larger areas of baldness who want the symptoms treated in a single sitting can now happily do so within the city limits as this treatment is now available here. All that needs to be done is to fix up an appointment to have a better understanding of the process so that they get the best possible results. It is a simple process where the hair is transplanted from the scalp to areas which doesn’t have much hair. It is an intrusive transplant procedure where a strip of scalp tissue is cut into thousands of follicular units. It is best suited for those who have larger bald areas which they want covered in a single sitting. This can go well with people who don’t mind stitches or a longer recovery period. Implanting single hair unit at the front. Implanting 2 hair units behind the hairline. Implanting 3 hair units behind the 2 hair unit(s). Then, Implanting 4 hair units behind the 3 hair unit(s). Poor or slow hair growth. Possibility of infection, though it is rare. Poor wound healing depending on the case. Those not willing to cut the hair short or having unrealistic expectations. People who do not have time for long session(s). People with larger bald area requiring more than 2500 grafts. This just the right thing for men who want good hair. This is a good option for those having baldness problems. This is quite good for females who don’t have hair on the front portion of the head. No alcohol 72 hours before the treatment. No smoking for a week before the treatment. No coffee/caffeine on the treatment day. Swelling for a few days. People of New Castle who long for good crop on the head or who have lost hair on the front portion of the head, can easily avail FUT hair transplant therapy without getting out of town. This advantage is bound to attract more and more people towards this mode of treatment. This is definitely going to show a picture where men and women of this place will have heads with good hair. 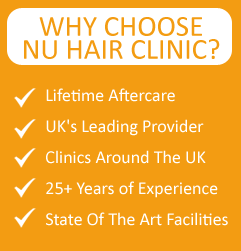 In New Castle, one can avail various therapies for the treatment of hair loss by making a call to NU hair. This is bound to make the people of the city smile as they no longer need to go out of town for the treatment of hair fall. The therapies would include PRP Therapy, Mesotherapy, FUE and FUT hair transplant. An appointment can be easily fixed by just making a call.